Derma gel is a wound dressing designed to aid in the treatment of bed sores and pressure ulcers Provides cooling and padding effect. 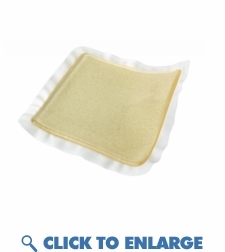 Manages bacterial burden Highly absorbent Contains 65% glycerine Cushions and protects wound Helps create moist wound environment Easy to apply and remove Indications: pressure ulcers, partial and full-thickness wounds, leg ulcers, surgical wounds, lacerations and abrasions, and first and second-degree burns. Contraindications: patients with known hypersensitivity to glycerin Maybe be left in place for up to 5 days Dressing change frequency will depend on amount of drainage. Provides cooling and padding effect. Indications: pressure ulcers, partial and full-thickness wounds, leg ulcers, surgical wounds, lacerations and abrasions, and first and second-degree burns. Dressing change frequency will depend on amount of drainage.